We have seen different HtmlHelper methods used to generated different html elements in the previous sections. ASP.NET MVC also includes a method that generates html input elements based on the datatype. Editor() or EditorFor() extension method generates html elements based on the data type of the model object's property. The following table list the html element created for each data type by Editor() or EditorFor() method. We will use the following model class with Editor and EditorFor method. Editor() method requires a string expression parameter to specify the property name. It creats a html element based on the datatype of the specified property. Consider the following example to understand the Editor() method. In the above example, we have specified property names of Student model as a string. 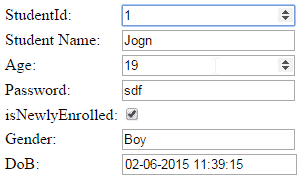 So, Editor() method created the appropriate input elements based on the datatype as shown in the above figure. EditorFor() method is a strongly typed method. It requires the lambda expression to specify a property of the model object. In the above example of EditorFor() method, we have specified the property name using the lambda expression. The result would be the same as the Editor() method as shown in the above figure.